Enjoy ogling all angles of the 10+ species of graceful rays and tropical fish in Reef Lagoon with two different webcams. Use this handy guide to identify the rays and fish swimming across your screen. New! Stream our graceful, otherworldly stingrays to your mobile device or Apple TV with the new Stingrays Live app. When do the rays eat? Feeding times are Tuesdays, Wednesdays, and Thursdays at 1:30 pm PDT. What do the rays and bony fishes eat? The rays eat clam tongue, prawns, squid, white bait, live Manila clams, and capelin. The bony fishes eat krill, gel food, and pellets. What species am I seeing? Check out our Reef Lagoon field guide. Why don’t I hear anything? At present, there is no microphone in the water or attached to presenters when they feed the fish. The fish may be sleeping. We dim and brighten our lights according to a schedule that best matches their natural habit. That may not correspond to the time zone where you are. The webcam doesn’t work on my computer. What should I do? Try launching the webcams via YouTube: Reef View and Lagoon View. The sperm-storing shark birth that confused even our own fish experts. Researchers have discovered a very stealthy new shark. Academy shark expert John McCosker on great white sharks, animals so big and powerful they "need no hyperbole." Watch reef fish dart through colorful forests of coral while giant rays sail gracefully under your feet. Stay connected—and get more out of your visit to the Academy—with our mobile apps. 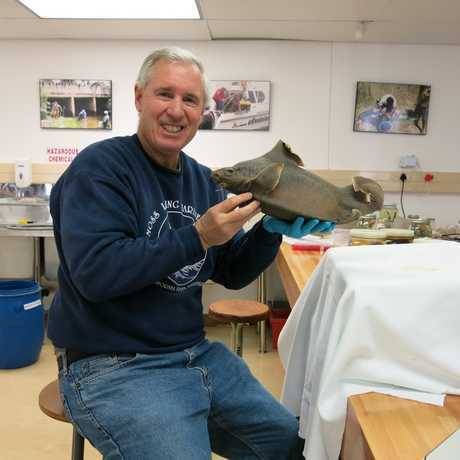 We chat with Dave Ebert, super shark scientist. Enjoy the best of the Academy, streaming 24/7. Meet the biologists of Steinhart Aquarium who care for the bony fish and rays and discover some of the facts behind the fiction. Every Tuesday, Wednesday, and Thursday at 1:30 pm at the Reef Lagoon. Our live webcams are installed in very wet and salty environments, and with animals that can get rambunctious at times. If you notice anything that doesn’t seem quite right with any of our webcams, please let us know by sending an email to webcams@calacademy.org.